It took about twenty centuries for the first in-socket artificial eyes to be developed. 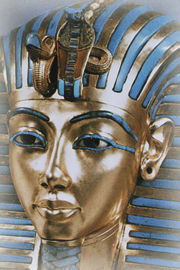 At first, these were made of gold with colored enamel. Then, in the latter part of the sixteenth century, the Venetians started making artificial eyes out of glass. These early glass eyes were crude, uncomfortable to wear, and very fragile. Even so, the Venetians continued making them and kept their methods secret until the end of the eighteenth century. After that, the center for artificial eye-making shifted to Paris for a time, but by the mid-nineteenth century, German glass blowers had developed superior techniques, and the center for glass eye-making moved to Germany. Shortly thereafter, glass eye-making was introduced in the United States. A chain of events, since the introduction of glass eye-making in the US, have lead to the development of medical grade acrylic plastic and its use in eye-making. The popularity of this method has continued to increase over the years, and today the vast majority of patients wear ocular prostheses made of acrylic.